I feel like I undervalue the humble bean in my cooking. They’re so pretty to look at dried, and can taste great cooked even if they lose some of their aesthetic value. But I never try to grow my own beans; I don’t like to use canned beans but it’s a hassle to prep dried beans… at the end of the day, seems like beans just end up taking up space in my pantry looking good and not doing much. My pantry has yellow-eyed peas, black-eyed peas, rattlesnake beans, pinto beans, kidney beans, adzuki beans… all manner of pulses in jars, ready to go. Boil the beans for 2 hours with peppers and onions. I’ve been looking forward to Tavce Gravce because it’s basically a bean casserole – cook beans, bake beans, eat beans. Wouldn’t it be great to add another bean to my life? Unfortunately, finding dried cannellini beans for the recipe proved difficult. Had I been on top of my game, I would have just gone to the Bob’s Red Mill store in Milwaukie for some beans. But that thought didn’t cross my mind until well after I’d cooked – and after I’d been to Whole Foods, New Seasons and Fred Meyer, all looking for dried cannellinis. By this point, I’d settled for Great Northern beans and went on my way. This was not a great meal. The flavors of the peppers in the bean-boil didn’t really go well with the paprika and everything else. This was one of the few times on this project where I’ve thought “I could make this better if I tried this again with a different method.” But onward we press. I also forgot to take a picture of the finished product. That, in a way, says how highly I thought of this meal. Place in pot, covered with water with room for evaporation. Add onion, garlic, dried peppers and a little olive oil. Cook beans on medium-high until soft, about 2 hours. Stir often and add water as needed. 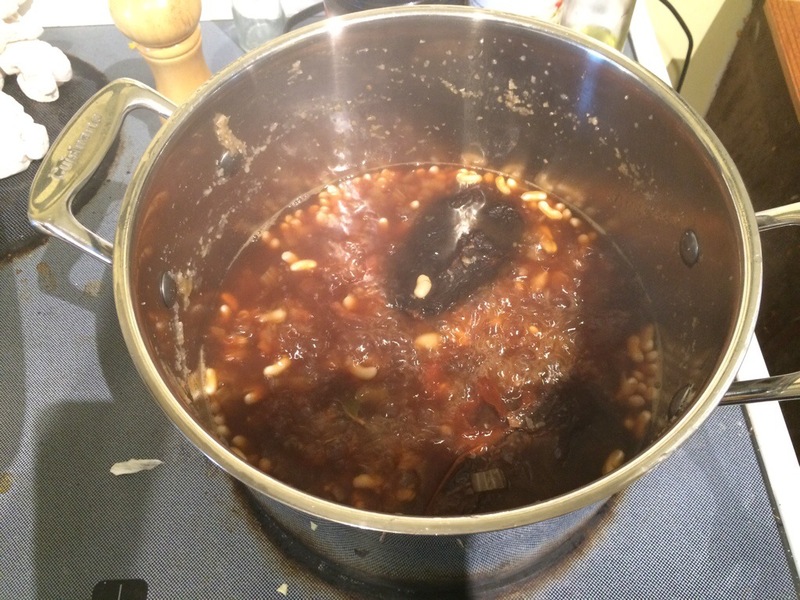 After two hours, beans should be at a stew-like consistency with very little water remaining. The goal isn’t to have a blended pot of beans, but to have whole beans that are soft. Heat high-heat oil (I used almond) until just below smoking, then add garlic, paprika and cumin. Add roux to bean mixture.